How the mighty have fallen. Once the proud leader of the Autobots, an instantly-recognizable hero in either of his iconic forms, and now he's a mere preorder bonus. Not just that; he's a retailer exclusive preorder bonus. Now who will light our darkest hour? Don't say Rodimus. He doesn't count. 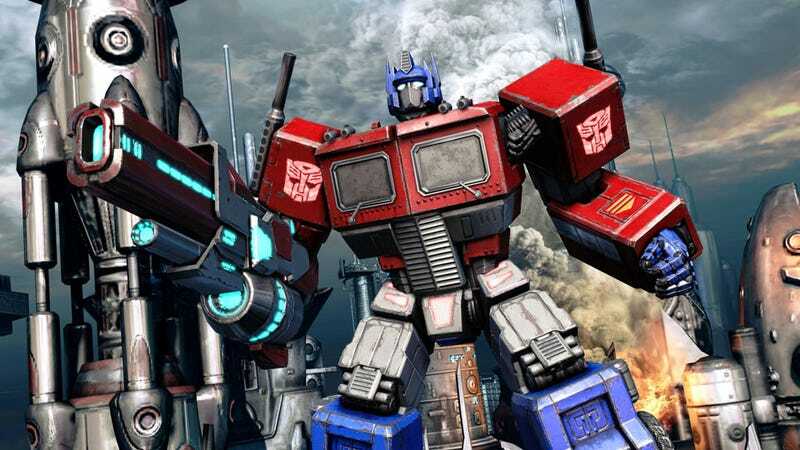 The G1 Retro pack is a GameStop exclusive preorder bonus for Transformers: Fall of Cybertron, giving players access to the most noble 'bot there ever was in both online multiplayer and single player game modes. Preorder customers will be able to effortlessly shift between statuesque robot and the semi that never goes out of style, no matter what Michael Bay thinks. I mean just look at that. I want one. The G1 Retro pack also includes the Megatron Gun and Shockwave Blast Cannon, two single player weapons inspired by two alternate modes children today are too coddled to appreciate. It's Transformers Generation Two Bruticus in all his Day-Glo glory. The second generation of Transformers toys used the original molds but made the characters hideously ugly to differentiate them from the original good ones. Disco Bruticus is available for the single player pleasure of Amazon.com preorder customers. So it's GameStop or nothing, right?